While the economy is better than a few years ago, many municipalities still struggle with tight budgets for a variety of reasons. Often when looking at where to make cuts, parks and recreation can become victim. 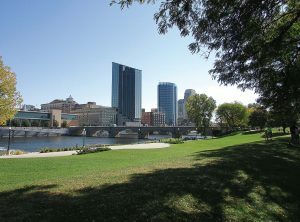 That was the case for the city of Grand Rapids, Mich., a few years ago when faced with having to make deep cuts in the budget, and city officials decided to merge the parks department with the department of public works. Grand Rapids Parks and Recreation Director David Marquardt said city officials have admitted it was “one of the worst decisions made,” so three years ago they reversed that decision and Marquardt was hired to head the parks department. He said when they became autonomous again, they were presented with an opportunity for grant money allowing them to write a new five-year master plan, which was adopted June 2017. Marquardt said throughout the process of creating the new master plan, “We were able to reenergize and reengage very good park supporters who never went away, but weren’t quite as engaged” in the transition time. Major support came from local organizations like family foundations or Friends of the Grand Rapids Parks. Marquardt said the parks department also has a lot of partners in the health care world who helped with the planning. He said the health care partnership is “primarily led by Kent County Health Department working through the federal REACH grant, which provides funding to support and invest in lower income neighborhoods.” He said they’ve also engaged in better collaboration with neighborhood associations to reach specific demographics and ensure the city is responding to their recreational needs. In 2013 they established smaller neighborhood Friends of the Parks groups or NP3’s, which concentrate on pools and programming in specific neighborhoods. There are reportedly 13 registered neighborhood associations in Grand Rapids and a handful of others not registered. These friends groups helped to get a millage on the ballot in 2012 dedicated to parks, which provided $3 million for park improvements and less than a million dollars to keep three city pools open and operating. Grand Rapids has an extensive list of collaborative partners to help support the 2,000 acres of park-owned land, including 74 parks and six city-owned cemeteries. Those partners include Grand Rapids Public Schools system, Friends of Grand Rapids Parks, neighborhood associations, health care organizations, business partners, family foundations, downtown Grand Rapids organizations and others. Marquardt said the parks department and the Grand Rapids Public Schools system entered into a joint — use agreement in the 1980s. He said businesses stepped up when they were undergoing major cuts. A real estate company committed resources to maintain Veterans Memorial Park. Spectrum Health, meanwhile, has taken care of the annual maintenance of Crescent Park. “It’s near its facility and gives its employees respite from daily work,” Marquardt said. 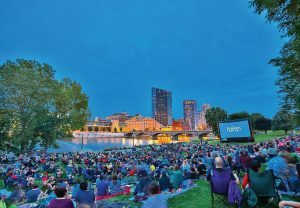 The Downtown Grand Rapids Development Authority has been a “key partner in our downtown park.” He said the downtown Grand Rapids organization hosts a summer series called Movies in the Park on Friday nights and actually runs the program. He said the downtown development district has to use revenue collected in the downtown in that area for the benefit of the community so this partnership brings benefits to both parties. Minneapolis is another city that has numerous partnerships and collaborations, and it’s likely a contributing factor in helping the city earn the distinction of being ranked as the No. 1 park system by Trust for Public Land Use in 2013, 2014, 2015, 2016 and 2017. Jayne S. Miller is the park superintendent for Minneapolis and shared some of the department’s bigger partnerships. One that has proven to be especially successful and popular with residents is the collaboration with local restaurants for concession operations. In 2004 Miller said they took one concession stand and converted it and sent out requests for proposals to have local restaurants operate it. They now have four local restaurants operating concessions at parks and are on the verge of two more. The parks are around lakes so they’re open only six months of the year. “The agreement states we get 12 percent of the revenue generated, and they also put money into an escrow account for the physical maintenance and upkeep of the building,” Miller said. She added that even though the parks department owns the buildings, making sure they’re well-maintained and aesthetically pleasing helps the restaurants’ business as well. “It’s a huge source of revenue for us and has become a destination in the parks — people will stand in line and wait — it’s become incredibly popular,” she said. Miller said the concession operations agreement with restaurants has generated $1.7 million in revenue. Beer and wine is served at these locations. “Every one (of the concession stands) is done by a local restaurateur, not a franchise, so they have their own unique menus,” Miller said. Minneapolis Parks also has partnerships with sailing clubs on three of the 22 lakes in the city-owned parks. They have kayak racks where people can leave their kayaks versus carrying them back and forth in addition to sailing schools operated by the sailing clubs. The sculptures do change from time to time, and Miller said they’re about to provide 70 new pieces of art for the grand reopening of the sculpture garden. The parks department also has a partnership with composer Andre Fisher where he brings mobile jazz into the parks, does concerts and offers lessons for children. 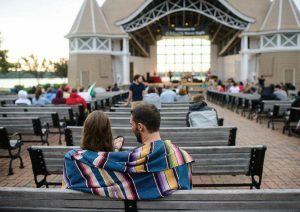 Minneapolis offers a summer concert and movies in the park series with over 200 concerts and 70 movies offered free to the public. Sponsors help defer the costs. Miller said they have “tons” of friends organizations and mentioned two, including People for Parks, which was formed in 1981 in response to a tornado that destroyed numerous trees — the organization ultimately replaced them. People for Parks continued on and now provides micro grants for staff education and maintenance. 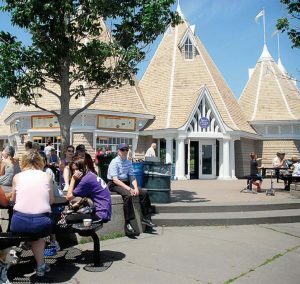 The Minneapolis Park Foundation is another nonprofit organization that helps with large capital projects. Right now it is working on a vision plan for the riverfront, and it secured $17 million in private donations. The two projects currently being worked on are Waterworks, which will reconstruct the old Mill Ruins Park, and 26th Avenue. Miller said there is a men’s and women’s garden club that helps take care of the gardens in the parks and numerous other friends groups that assist with the large park system, including 6,804 acres of park land and 179 parks, 394 athletic fields, 63 outdoor ice skating rinks, 12 beaches, 15 miles of cross country trails and 163 miles of walking trails. Minneapolis’ park and recreation department has $112 million annual budget. Marquardt said it’s helpful to have city leadership on your side when entering into these partnerships, and it’s helpful to have the partner organizations tell city leadership, “This is something important to us—we want to get engaged.” He also suggested building a deeper understanding of the worth of the park system. Sometimes volunteer organizations can be passionate at the onset of a project, but long-term maintenance can often fall on the city’s shoulders. Marquardt was asked how to handle a situation like that. He said stewardship is a big part of the new five-year master plan. One example is getting people comfortable with looking at parks differently so it’s less about having a perfectly manicured green space and more about “natural beauty and wildlife.” Maintaining those relationships long term means staying in contact with the organizations and businesses. Marquardt also advised attending meetings of the partner organizations whenever possible. Miller said good communication, making sure the agreement is clear to both parties and staff support is key to her city’s successful agreements.